During the early 1800s, Tecumseh, a leader of the Shawnee, attempted to unite American Indian tribes west of the Appalachian Mountains into a confederation. Tecumseh believed that the land did not belong to a single tribe. In reality, no one owned the land except for the Master of Life, the Shawnees' principal god. Tecumseh believed that the only way that American Indians could transfer land to the Americans was if every tribe agreed to it. Tecumseh wanted to force the Americans to deal with all of the tribes in unison. Separately, the individual tribes did not have much power. Together, Tecumseh hoped, they would be a major deterrent to white expansion. . . .the only way to stop this evil [white settlement of the Indians' land], is for all the red men to unite in claiming a common and equal right in the land as it was at first, and should be now - for it never was divided, but belongs to all. . . .Sell a country! Why not sell the air, the clouds and the great sea, as well as the earth? Did not the Great Spirit [Master of Life] make them all for the use of his children? In his quest, Tecumseh received assistance from his younger brother Tenskwatawa. Known as the Prophet, Tenskwatawa believed that the American Indians had to end their reliance on American goods, such as alcohol, iron cookware, and guns. The Indians had angered the Master of Life by becoming dependent on these items. If the American Indians forsook them, the Master of Life would reward his followers by driving the Americans from their land. Many Indians found the Prophet's message appealing and began to congregate at his village, Prophetstown, in the Indiana Territory. Tecumseh used his brother's influence to convince the American Indians to put aside their traditional differences and unite together against the whites. He also visited many tribes west of the Appalachian Mountains and east of the Mississippi River seeking additional support for his confederation. Tecumseh was a firm believer that more people translated into more power. While most tribes listened to Tecumseh's proposal, many rejected his ideas. This was especially true of Indians in modern-day Tennessee, Georgia, and Mississippi. Many of the Prophet's followers embraced white products and customs. They did not want to lose access to these goods. Tecumseh had more success in Ohio, Kentucky, and the Indiana Territory, areas that whites had been attempting to settle since before the French and Indian War. Unfortunately for the American Indians in the region, Tecumseh's Confederacy failed. Many American Indians refused to relinquish their white ways and end their friendships with the Americans. The Anglo-American settlers also greatly outnumbered the American Indians and had greater access to firearms and ammunition. As Tecumseh's followers began to converge at Prophetstown, he also could not provide them with adequate food and shelter. To acquire white goods, American Indians engaged in the fur trade with the Americans. This trade greatly diminished the animal population in Ohio, Kentucky, and the Indiana Territory, leaving the Indians with less to eat. In 1811, William Henry Harrison led an American army against Prophetstown. Tecumseh was seeking allies in the southern part of the United States. Although Tecumseh had asked his brother not to attack the Americans in his absence, the Prophet did attack. When Tecumseh returned, Prophetstown no longer existed. The natives had abandoned it, and Harrison had then destroyed it. Many of his followers, hungry and defeated, returned to their former villages. They were unwilling to assist Tecumseh in forming his confederation. Tecumseh did try to recreate his confederacy, but he had only limited success. 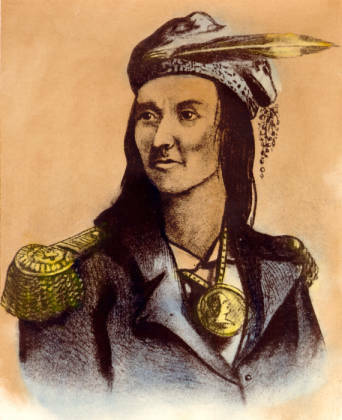 Tecumseh's quest formally ended in 1813, with his death at the Battle of the Thames in the War of 1812.